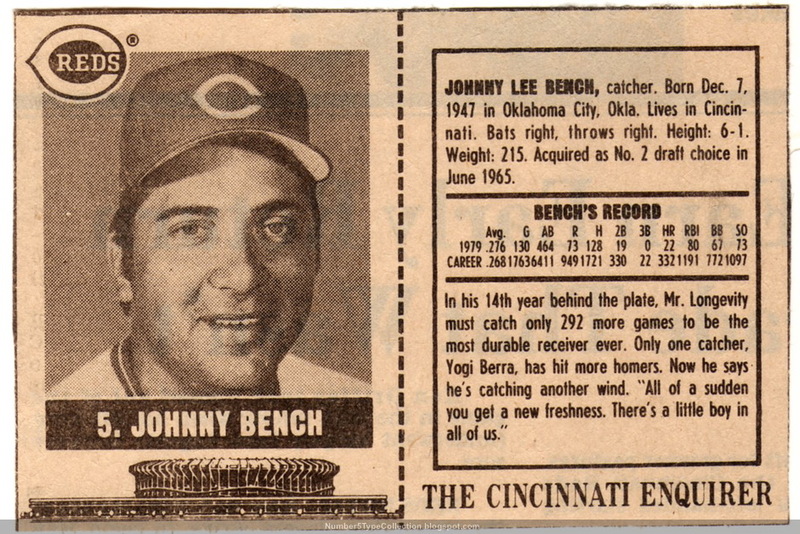 Completing our recent "great backstops of the 70s" trend, here's Johnny...Bench. 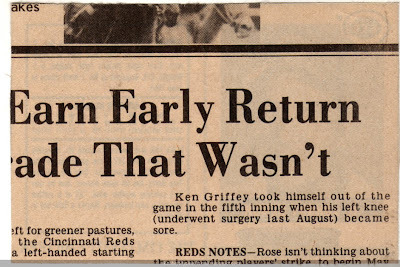 The Cincinnati Enquirer, which now runs Cincinnati.com, printed these profiles of the Reds as newspaper clip-outs from March to May in 1980. Numbered by player uniform and relatively small in size, it looks like you folded along the dotted line to make a "card." 32 players in all, this set includes Big Red Machine stars like Bench, George Foster, Dave Concepcion, and Tom Seaver. Even this small clip of newspaper references some important things. Ken Griffey, Sr. appeared in the 1980 All-Star Game, homered off Tommy John, and was named MVP. From "for greener pastures" and "left-handed starting," I infer the Reds went shopping for a free-agent pitcher. Nothing in their 1980 transactions log looks like a match, unfortunately. Speaking of their 1980 transactions, check out these 2 draft choices from that year. Drafted Danny Tartabull in the 3rd round of the 1980 amateur draft. Player signed June 10, 1980. Drafted Eric Davis in the 8th round of the 1980 amateur draft. Player signed June 8, 1980. Tartabull did well for several other teams and finding Eric Davis in the 8th round is not bad at all. 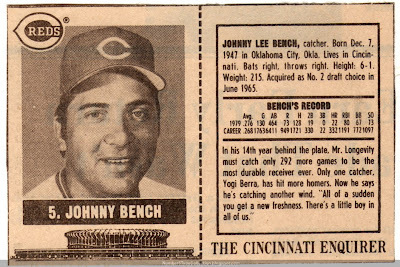 Value: This is a very scarce set, at least outside of Cincinnati. While Bench is listed at $9 in the SCD annual guide, actual selling prices are uncertain. I've only seen near-sets on eBay, so assume collectors tried to get the whole team. Reprints / fakes: It'd be fairly easy to fake this, assuming you had blank newsprint, but demand is too low to make it worthwhile. How did you come about obtaining this card? I have never seen them offered at card shows or the like. I know that it is a regional oddball, but I'm curious. Picked up one of the 2 near-sets I've seen on eBay! Best I can tell, it came from a former Ohioan who kept them out of specific nostalgia for the 1980 Reds.